The term "atrial flutter" refers to a heterogeneous group of macro-reentrant arrhythmias including isthmus-dependent (typical) reentry around the tricuspid annulus, reentry around a surgical incision that is not necessarily isthmus-dependent, functional reentry (leading circle reentry), or reentry involving a combination of these conduction barriers (30). Fig. 4. Atrial flutter with 1:1 ventricular conduction. 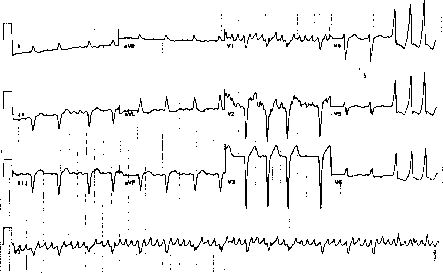 Two lead telemetry strips recorded during atrial flutter with 1:1 conduction (top two strips) and after adenosine, with transient high level AV-nodal block (bottom two strips). The key to the diagnosis of 1:1 atrial flutter, is that the interval between QRS complexes in the top tracing is equivalent to the atrial cycle length in the bottom two tracings. (greater than 350 BPM) and the flutter waves in leads II, III, and aVF are usually positive (see Fig. 3). The ventricular rate in atrial flutter depends on the AV conduction ratio and is usually 140-160 BPM because of 2:1 atrioventricular (AV) conduction. Atrial flutter should be considered in any supraventricular tachycardia (SVT) with rates near 150 BPM. 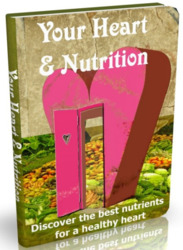 The conduction ratio is usually a multiple of the atrial rate, and may be 2:1, 4:1, 6:1, etc. Higher conduction ratios may be seen in patients with AV nodal disease or in the presence of drugs slowing AV conduction (such as digitalis, verapamil, or beta-blockers). Importantly, 1:1 conduction is usually poorly tolerated hemodynamically, and if prolonged, may degenerate into ventricular fibrillation (VF). 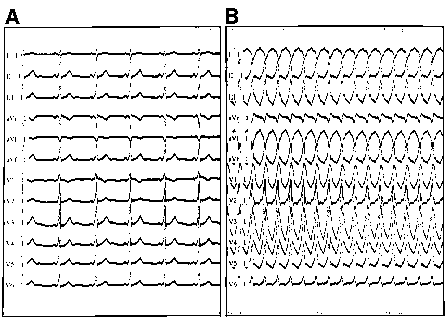 One-to-one conduction during atrial flutter may be seen in patients with accessory pathways and in the presence of hyperadrenergic states (such as critical care, postsurgical, and intravenous [iv] inotopes). Patients taking class I agents without adequate protection from medications to slow AV conduction are at risk for rapid ventricular conduction because the atrial rate may be slowed sufficiently to allow 1:1 conduction (27,28) (see Fig. 4). Patients started on a class I antiarrhythmic should always be treated with a beta-blocker, verapamil, or diltiazem to slow AV conduction enough to prevent this serious complication. The ventricular rhythm may be regular if there is a fixed AV conduction ratio, or irregular if there is variable AV conduction. Grouped beating may be observed in the presence of Wenckebach periodicity within the AV node. Vagal stimulation (i.e., carotid sinus massage, Valsalva maneuver) or iv adenosine may temporarily slow the ventricular rate to reveal the typical saw-toothed atrial pattern. Atrial flutter usually does not "break" with these interventions, whereas AV-node reentry or AV-reciprocating tachycardia usually converts to sinus rhythm. Coarse AF may look organized in lead V1, and can be mistaken for atrial flutter (see Fig. 5). The distinction between AF and atrial flutter is helped by the lack of organized and regular flutter waves in the inferior leads and the irregular ventricular rates in AF. Fig. 5. Coarse AF. Note the organized undulations in lead V1, which can be mistaken for flutter waves. The variability in the cycle length of the "pseudo-flutter waves," the irregular ventricular rhythm, and the lack of organized flutter waves in the inferior leads are evidence that this is AF.